Background: Heart failure is an important cause of morbidity and mortality in developing nations like Nigeria. Sleep apnea and snoring has recently been recognized to be a cardiovascular risk factor. Sleep apnea is yet to be well studied among Africans with heart failure. We aimed to determine the prevalence of snoring and high risk for obstructive sleep apnea among Nigerians with stable heart failure. Materials and Methods: We studied 103 subjects that included 62 patients with heart failure and 41 control subjects. Demographic parameters and clinical examination were performed on the participants. The Berlin score and the Epworth Sleepiness Scale were administered for each participant. Echocardiography was done on all participants. Statistical analysis was done using Statistical Package for Social Sciences (SPSS) 17.0. Results: Snoring was reported in 48.4% of subjects with heart failure compared to 22.0% of control subjects ( P < 0.005). High risk for obstructive sleep apnea using the Berlin score was documented in 51.6% of heart failure subjects compared to 7.31% of controls. Excessive daytime somnolence occurred more in heart failure patients (51.6% vs. 9.8%, P < 0.05). Snorers tended to be older and were more likely to be obese than nonsnorers. Systolic blood pressure and fasting blood sugar were significantly higher among heart failure subjects with snoring than those without snoring (131.9 ± 19.2 vs. 119.2 ± 15.7 and 6.0 ± 0.8 vs. 5.4 ± 2.7, P < 0.005). Conclusion: Heart failure seems to be associated with snoring and a high risk for obstructive sleep apnea among Africans with heart failure. Assessment for sleep disordered breathing should be incorporated into their routine clinical workup. The aim of this study was to describe the prevalence of snoring and the risk for OSA using the Berlin score and the Epworth Sleepiness Scale (ESS) among Nigerian subjects with heart failure compared to normal controls. One hundred and three subjects were consecutively recruited for this study. They included 62 subjects with diagnosis of congestive heart failure (CHF). Diagnosis of heart failure was made using standard criteria. Forty-one control subjects were also recruited. They were patients' relatives, hospital staffs, and willing adults who gave informed to participate in the study. The study location was the cardiology clinic of Ladoke Akintola University of Technology Teaching Hospital, Osogbo, Nigeria. It was a cross-sectional study. Patients with clinical heart failure were on optimized medical therapy including, but not limited to, angiotensin converting enzyme inhibitors (ACE-I) or angiotensin receptor blockers (ARB), diuretics, aldosterone antagonist, and antiplatelets/anticoagulants. Clinical and demographic parameters including age, gender, body weight (in kilograms), height (in meters), waist circumference, and hip circumference of all participants were taken. Blood sample was taken after at least 8 h of overnight fasting to determine the fasting blood glucose using the glucose oxidase method. Informed consent was taken from each participant. Ethical approval was obtained from the Institutional Ethical Review Board. Statistical analysis was done using the Statistical Package for Social Sciences (SPSS) 17.0 (Chicago, IL, USA). Numerical data were summarized using means and standard deviation, while categorical data were summarized using frequencies and percentages. Comparison between groups was done using t0-test and Chi-square test. P < 0.05 was taken as statistically significant. [Table 1] shows the clinical and demographic characteristics of the study population. Subjects with heart failure were significantly older than control subjects. Mean waist circumference, body mass index, frequency of obesity, and diastolic blood pressure were not significantly different between the subjects with CHF and controls. 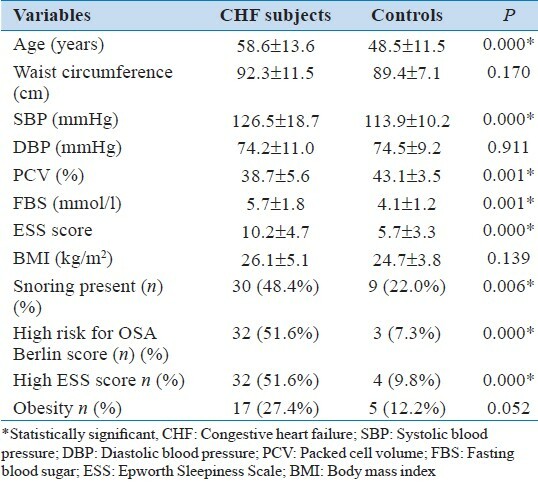 Mean systolic blood pressure, mean ESS score, and fasting blood sugar were significantly higher among CHF subjects than controls as shown in [Table 1]. The prevalence of snoring among subjects with CHF was significantly higher than control subjects (48.4% vs. 22.0%, respectively, P < 0.05). High risk for OSA using the Berlin score was found in 51.6% and was significantly higher among the CHF subjects than controls (7.3%) ( P < 0.05). The frequency of high ESS score (ESS score > 11) was also significantly higher among CHF subjects than controls (51.6% vs. 9.8%, P < 0.05). [Table 2] shows that CHF-snorers were significantly older than CHF-nonsnorers. CHF-snorers had a significantly higher mean waist circumference, mean body mass index, systolic blood pressure, fasting blood sugar, and ESS than CHF-nonsnorers. Mean left ventricular mass and left ventricular mass index were significantly higher among CHF-snorers than CHF-nonsnorers. Although mean ejection fraction was lower among CHF-snorers than nonsnorers, it was not statistically significant. This study showed that snoring is very common among subjects with heart failure. It also revealed that a significantly higher proportion of heart failure patients were recognized to be at high risk for having OSA and that heart failure may be a risk factor for SDB among Nigerians with heart failure. It therefore brings to light the relevance of screening for snoring and risk for sleep apnea among subjects with heart failure. This is in agreement with other studies that have documented a high frequency of sleep apnea and snoring among subjects with heart failure. These studies have documented the prevalence of SDB in heart failure subjects to be between 40% and 70%. ,,, Other authors have reported a prevalence of 11%-37% which is lower than that reported in this study. , The prevalence of snoring reported in this study is more than what was reported by Adewole, et al. among a heterogeneous population of Abuja residents where snoring was documented in 31% of the study participants. The lower prevalence in this study may be due to several reasons. It may be due to underreporting of snoring among our patients as there is a minimal form of social stigma associated with snoring in our environment. Secondly, our sample size was fairly small. Thirdly, we did not use polysomnography for evaluation and this might have underestimated the burden of SDB among the study participants. We depended on the assessment of risk for OSA using the Berlin Questionnaire. Heart failure is associated with depressed and fatigued cardiovascular tolerance and reserve with many neurohormonal dysfunctions. SDB is also associated with increased inflammatory activation, endothelial dysfunction,  increased neurohormonal activation, and recurrent hypoxemia leading to myocardial ischemia. ,, Therefore, it may be presupposed that heart failure subjects with SDB are likely to have more adverse cardiovascular risk than those without SDB. Mansfield, et al. showed that heart failure patients with SDB often have higher New York Heart Association classes and worse underlying heart functions than those without SDB. 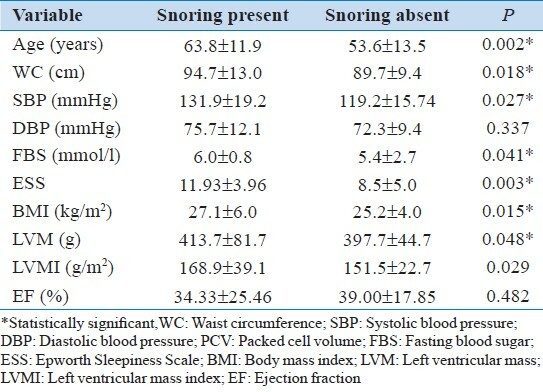 This may therefore account for the result of this study showing that heart failure subjects with snoring had a significantly higher waist circumference, systolic blood pressure, left ventricular mass, left ventricular mass index, body mass index, and a higher degree of daytime excessive sleepiness using the ESS than heart failure subjects without snoring. Obesity is also associated with increased cardiovascular morbidity. Adipocytes contribute to increased inflammation, endothelial dysfunction, and oxidative stress. The relationship of obesity to snoring has been recognized by several authors. ,, This may be the reason why CHF-snorers in this study had significantly higher mean body mass index and waist circumference than CHF-nonsnorers. The increased left ventricular mass index and the higher prevalence of left ventricular hypertrophy among CHF-snorers also further suggest an increased cardiovascular risk than among CHF-nonsnorers. EDS presents safety concerns, as it may have a negative impact on reaction time, decision making, and safe operation of machinery and motor vehicles. They are thereby prone to domestic and road traffic accidents, loss of concentration, and reduced productivity. Other factors may contribute to sleep abnormalities in patients with heart failure and these include medications (diuretics), nocturnal pain or dyspnea, poor sleep habits, environmental factors, and depression. Although the mechanisms by which OSA and CHF are related are not completely understood, various potential mechanisms include the effect of hypoxia, hypercapnia, baroreceptors desensitization, and arousal responses which contribute to acute and chronic augmentation of the sympathetic nervous system. The clinical features of SDB include sleep fragmentation and excessive daytime somnolence. This was manifested by the fact that the ESS score was significantly higher among heart failure subjects with SDB than those without SDB. In conclusion, snoring and high risk for sleep apnea are highly prevalent in CHF. Heart failure subjects with SDB seem to be associated with a higher cardiovascular risk than heart failure subjects without SDB. Further studies are suggested to document the pathogenetic association and the therapeutic modalities for reducing the CV risk in heart failure subjects with SDB. Giving the high prevalence of SDB in heart failure subjects, assessment for sleep disorders may be included in their clinical care in order to further reduce the cardiovascular risk. 1. Malhotra A, White D. Obstructive sleep apnea. Lancet 2002;360:237-45. 2. Leung R, Bradley D. Sleep apnea and cardiovascular disease. Am J Respir Crit Care Med 2001;164:2147-65. 3. Shahar E, Whitney CW, Redline S, Lee ET, Newman AB, Javier Nieto F, et al. Sleep-disordered breathing and cardiovascular disease. Am J Respir Crit Care Med 2001;163:19-25. 4. Kohnlein T, Welte T, Tan L, Elliot M. Central sleep apnoea syndrome in patients with chronic heart disease: A critical review of the current literature. Thorax 2002;57:547-54. 5. Caples SM, Garcia-Touchard A, Somers VK. Sleep-disordered breathing and cardiovascular risk. Sleep 2007;30:291-303. 6. Task Force for the Diagnosis and Treatment of Chronic Heart Failure of the European Society of Cardiology: Guidelines for the diagnosis and treatment of chronic heart failure: update 2005. Eur Heart J 2005;26:1115-40. 7. Sin DD, Fitzgerald F, Parker JD, Newton G, Floras JS, Bradley TD. Risk factors for central and obstructive sleep apnea in 450 men and women with congestive heart failure. Am J Respir Crit Care Med 1999;160:1101-6. 8. Oldenburg O, Lamp B, Faber L, Teschler H, Horstkotte D, Topfer V. Sleep-disordered breathing in patients with symptomatic heart failure: A contemporary study of prevalence in and characteristics of 700 patients. Eur J Heart Fail 2007;9:251-7. 9. Chan J, Sanderson J, Chan W, Lai C, Choy D, Ho A, et al. Prevalence of sleep disordered breathing in diastolic heart failure. Chest 1997;11:1488-93. 10. McMurray J, Stewart S. Epidemiology, aetiology and prognosis of heart failure. Heart 2000;83:596-602. 11. Bradley D, Floras S. Sleep apnea and heart failure. Part I: Obstructive sleep apnea. Circulation 2003;107:1671-8. 12. Bradley D, Floras S. Sleep apnea and heart failure. Part II: Central sleep apnea. Circulation 2003;107:1822-6. 13. Ferreira S, Winck J, Bettencourt P, Rocha-Gonçalves F. Heart failure and sleep apnoea: To sleep perchance to dream. Eur J Heart Fail 2006;8:227-36. 14. Hunt SA, Abraham WT, Chin MH, Feldman AM, Francis GS, Ganiats TG, et al. ACC/AHA 2005 guidelines update for the diagnosis and management of chronic heart failure in adult. Circulation 2005;112:e154-235. 15. American Sleep Disorders Association, author, editor. The international classification of sleep disorders, revised: Diagnostics and coding manual. Obstructive sleep apnea syndrome. Rochester, MN: American Sleep Disorders Association; 2001. 16. Netzer NC, Stoohs RA, Netzer CM, Clark K, Strohl KP. Using the Berlin Questionnaire to identify patients at risk for the sleep apnea syndrome. Ann Intern Med 1999;131:485-91. 17. Vazir A, Hastings P, Dayer M, McIntyre H, Henein M, Poole-Wilson P, et al. A high prevalence of sleep disordered breathing in men with mild symptomatic chronic heart failure due to left ventricular systolic dysfunction. Eur J Heart Fail 2007;9:243-50. 18. Schulz R, Blau A, Borgel J, Duchna H, Fietze I, Koper I, et al. Sleep apnea in heart failure. Eur Respir J 2007;29:1201-5. 19. Jahaveri S, Parker TJ, Liming JD, Corbett WS, Nishiyama H, Wexler L, et al. Sleep apnoea in 81 ambulatory male patients with stable heart failure. Types and their prevalences, consequences and presentations. Circulation 1998;97:2154-9. 20. Solin P, Bergn P, Richardson M, Kaye DM, Walter EH, Naughton MT. Influence of pulmonary capillary wedge pressure on central apnoea in heart failure. Circulation 1999;99:1574-9. 21. Adewole OO, Hakeem A, Fola A, Anteyi E, Ajuwon Z, Erhabor G. Obstructive sleep apnoea among adults in Nigeria. J Natl Med Assoc 2009;101:720-5. 22. Smith LA, Chong DW, Vennelle M, Denvir MA, Newby DE, Douglas NJ. Diagnosis of sleep-disordered breathing in patients with chronic heart failure: Evaluation of a portable limited sleep study system. J Sleep Res 2007;16:428-35. 23. Ferreira S, Marinho A, Patacho M, Santa-Clara E, Carrondo C, Winck J, et al. Prevalence and characsteristics of sleep apnoea in patients with stable heart failure. Results from a heart failure clinic. BMC Pulm Med 2010;10:9. Available from: http://www.biomedcentral.com/1471-2466/10/9. [Last accessed on 2011 Oct 05]. 24. Mansfield D, Kaye DM, Brunner La Rocca H, Solin P, Esler MD, Naughton MT. Raised sympathetic nerve activity in heart failure and central sleep apnoea is due to heart failure severity. Circulation 2003;107:1396-400. 25. Pepperell JC, Ramdassingh-Dow S, Crosthwaite N, Mullins R, Jenkinson C, Stradling JR, et al. Ambulatory blood pressure after therapeutic and subtherapeutic nasal continuous posivite airway pressure for obstructive sleep apnoea: A randomised parallel trial. Lancet 2002;359:204-10. 26. Becker HF, Jerrentrup A, Ploc T, Grote L, Penzel T, Sullivan CE, et al. Effect of continuous positive airway pressure treatment on blood pressure in patients with obstructive sleep apnea. Circulation 2003;107:68-73.